My niece was getting married in Maine last week, so my siblings and I rented a large house and spent the whole week in Castine, Maine. It was such a beautiful area and there was a lot to see and do. However, as a quilter, I guess I have to admit that it is impossible for me to spend a whole week without a fix. I need to be working on t-shirt quilts, memory quilts or other customer quilts and sometimes my quilts. If I can’t do that, I have to find a quilt shop. I managed to make it four days in Maine until I finally had to locate a quilt shop. Fortunately, both of my sisters like to quilt as well, so they were game to go with me. 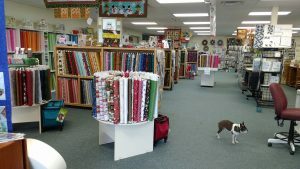 We visited The Cotton Cupboard quilt shop in Bangor, Maine. The shop offers a variety of classes from beginner to master. They had a very nice selection of fabric and a large batik section. The shop also had a resident dog named Grace. My youngest sister is a lover of all dogs, but especially Boston Terriers, so she and Grace spent quite a bit of time together. After we made our fabric choices and got ready to leave, Grace was not happy that my sister was leaving and wouldn’t look at us as shown in the picture. The Cotton Cupboard was definitely worth the trip from Castine to Bangor, so if you get a chance to visit, you too can be greeted by Grace and the friendly staff. They’ll be happy to see you.